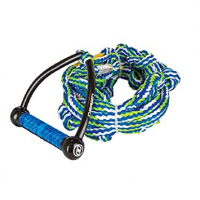 Pro Surf Rope- 9” wide handle with our plush fabric grip designed for your comfort. With three 4’ removable extensions, each containing loops every 6”, this floating line gives you the ultimate flexibility for finding your perfect line length anywhere between 13’ and 25’. The Nalu has a single fin and larger than normal flat spot to make catching both large and small waves effortless. Featuring a concave top deck for maximum comfort and control, the Nalu is perfect for cruising behind the boat or throwing skim tricks. The PRIMO is a do-it-all surf vehicle for any wake! Our vacuum formed outer skin construction makes this board bulletproof and ultra-light! The fin options make this perfect for anyone looking for an aggressive, yet in control surf ride. Ride it as a Twin Fin for stability and drive down the line, or ride it as a single fin for that loose skim feel Tommy’s boards have been known for.